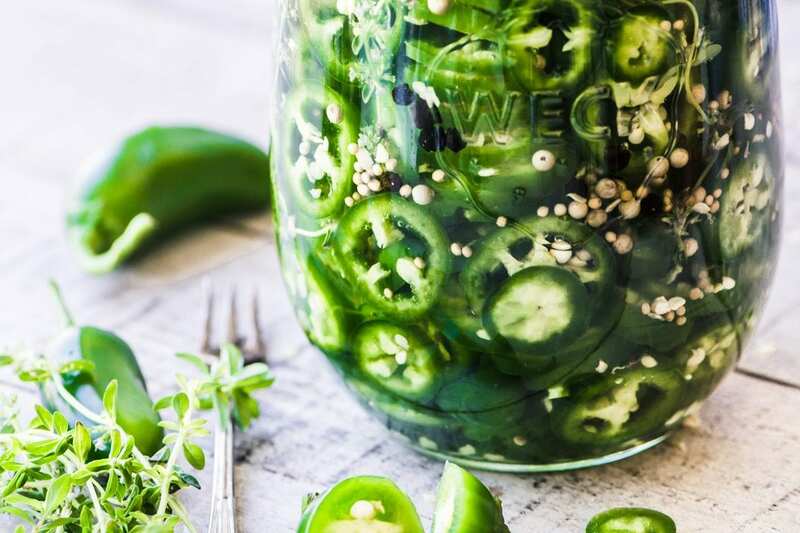 Quick Pickled Jalapeños ~ your pickles are ready in the time it takes you to slice your peppers, and you’re going to want to load up on these, because jalapeños make everything better! 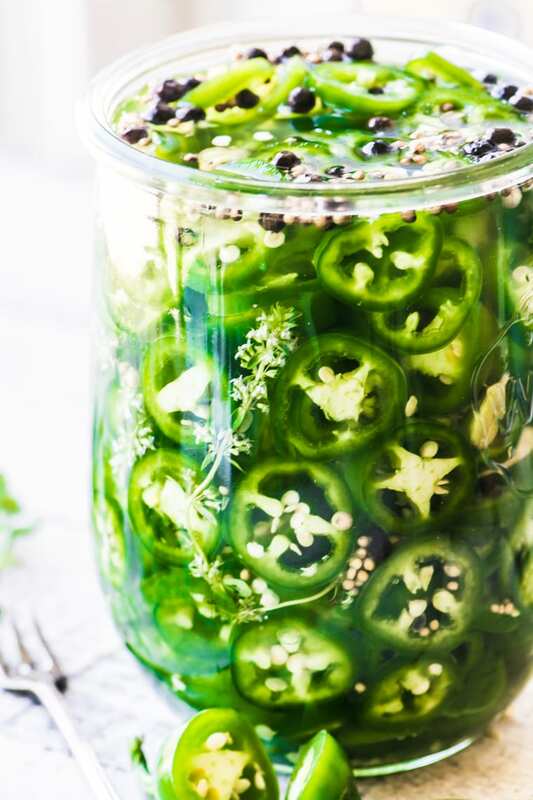 Imagine opening your fridge door and seeing a quart of these green gems peering out at you…I adore jalapeños, I try to pick up a few every time I’m at the grocery store just so I can add some zing to whatever I’m cooking. I think they’ve got the perfect gentle kick of heat without being overpowering. So when a neighbor dropped off a whole pound of garden chiles yesterday I couldn’t believe my luck! I love this quick pickling ~ quicking! 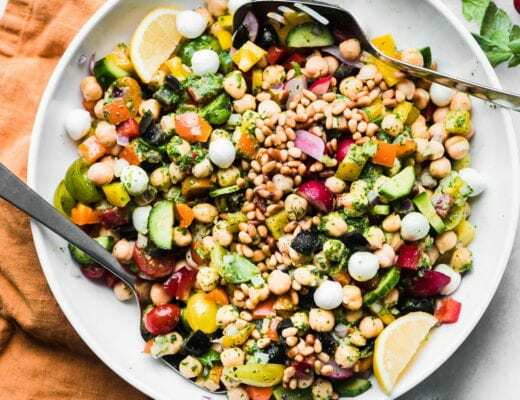 ~ method because it allows you to transform and preserve summer produce of all kinds with minimal processing ~ that means you keep all the crunch and fresh flavor. And even if you don’t think you like jalapeños, try these, you can even add some sugar to the brine to sweeten them up and blunt the heat. My mouth is watering just thinking about piling these on our burgers and brats. 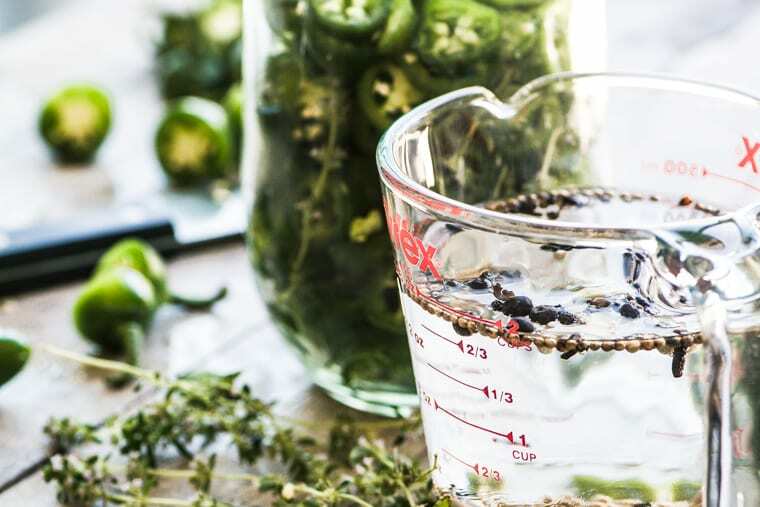 I used a full pound of jalapeños to make this recipe, but remember, you can scale this down easily ~ even if you have just a handful of peppers you can do this, the proportion of water to vinegar is an easy to remember 1 to 1. I used the same principles in my QUICK PICKLED VIDALIA ONIONS. 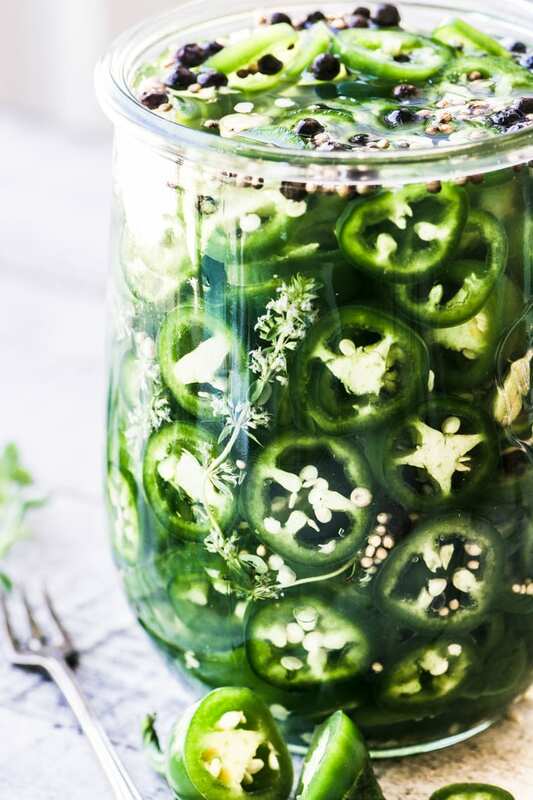 Slice up the jalapenos and add them to a quart sized jar. (This recipe is for quick picked jalapeño slices, or rings, but you can pickle whole jalapeños if you like, check my notes below.) I used just shy of a pound to fill my jar. 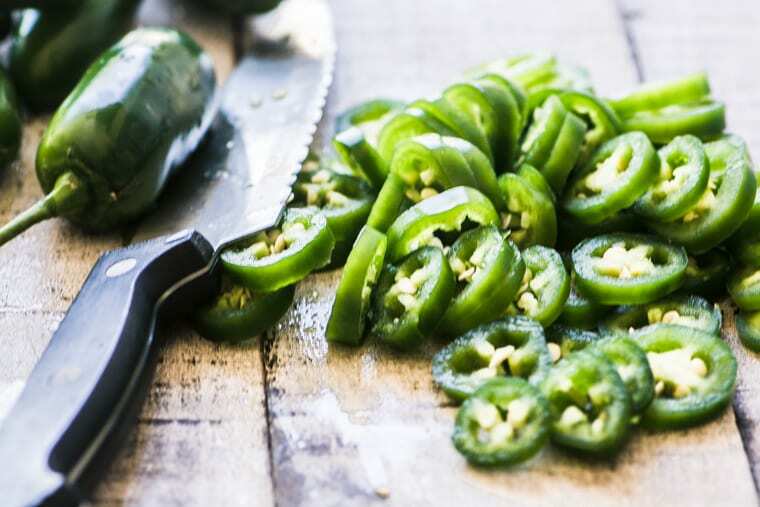 TIP: Jalapeños vary in their heat level, and if you’re sensitive it pays to use caution when working with them. I do it bare-handed but you can use gloves if you like. Whatever you do, make sure to wash your hands thoroughly when you’re done, and then wash them again. The capsicum oils can remain on your hands for hours and cause problems later if you rub your eyes ~ or pick your nose…just sayin’. I found some pretty flowering thyme on my walk this morning so I threw that in with the peppers, why not? Just mix it up and pour it over the peppers, just make sure the peppers are submerged. Then seal and refrigerate. You can eat them right away, or store in the fridge for up to 2 months. I should note that the peppers will quickly turn from bright green to an olive green as they react with the vinegar, so expect that. I can’t wait ~ we’re having brats for dinner tomorrow! This is a recipe for pickled jalapeños with no sugar, but you can add some in if you like. The sugar will sweeten the mixture slightly, but more importantly it will cut the heat of the peppers. The more sugar you add, the less heat you’ll get. The seeds contain most of the heat of the peppers, so leave them out for a milder pickle. To do this immerse your jalapeño slices in a big bowl of cold water and skim away the seeds, then drain and bottle. If your mouth is on fire, reach for a glass of milk, beer, or cocktail, not water! The hot capsaicin oils in chiles are soluble in alcohol and full fat dairy, only, water won’t help at all. 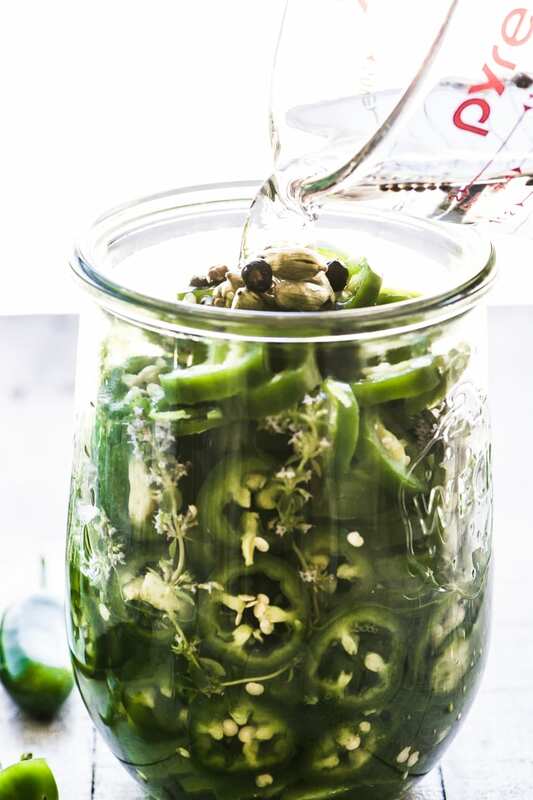 TIP: DO NOT throw away the pickling liquid, you can use it to pickle more jalapeños! Some of my favorite recipes are diy condiments ~ if this idea interests you, I recommend my OLD FASHIONED RELISH, or my HOMEMADE KETCHUP. One of my most popular is the amazing 30 SECOND MAYONNAISE. Once you try that you’ll never need to bother with bottled mayo again. Wash and trim the stems from your peppers. Slice them and put them into a clean quart sized jar. I add the seeds, too, but if you like things a little less spicy, you can leave them out. Mix the water, vinegar, sugar (if using) and spices in a bowl or large measuring cup with a spout. 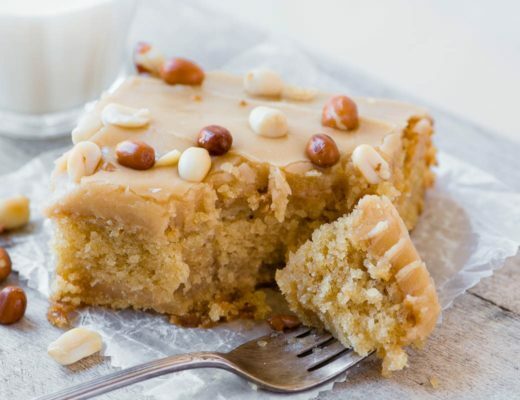 If you're using the sugar, be sure to stir until it has completely dissolved. Pour the liquid, and spices, over the peppers. Note: if the liquid doesn't completely cover the peppers, add more vinegar. The peppers will keep up to 2 months. 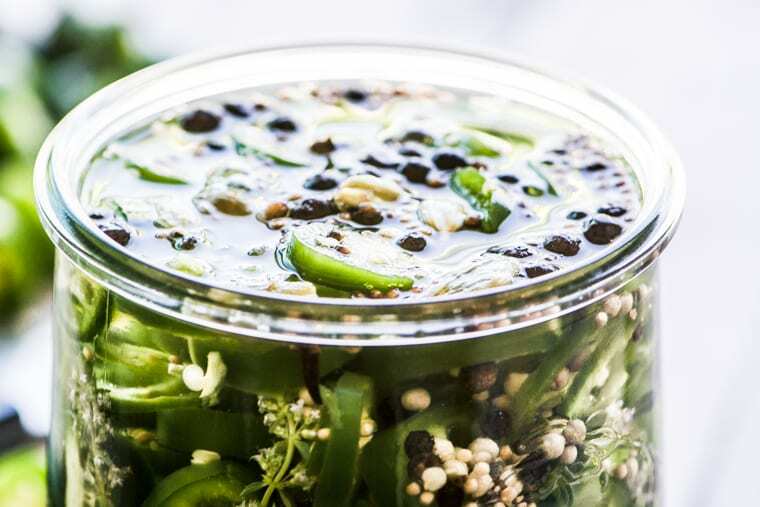 You can pickle the whole peppers, if you like…but be sure to stab them with the tip of a sharp knife in several places to allow the pickling liquid to penetrate. Simplify the process and use 2 Tbsp pickling spice. Make quick pickled jalapeños and onions by adding some sliced red onion to the jar. Make quick pickled jalapeños and carrots by adding sliced carrots. Use red jalapeños, which are the same pepper, only more ripe. If you want to can these quick pickled peppers, process for 10 minutes in a hot water bath. For a detailed but easy recipe see here. Thanks for the great tip, Lynda, you remind me that I used to use pine tar soap many years ago, it’s better for the environment, too, I think. 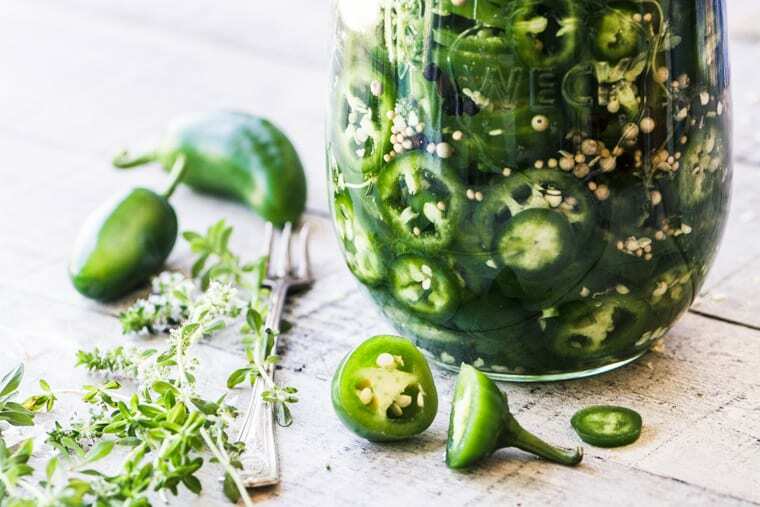 Gorgeous work and such great tips… I always seem to have some eye burn after canning jalapenos because those natural oils linger on my hands.. then I forget :/. I just finished off last year’s pickled jalapeños and I am ready for this season’s! But these … I love the additional mustard and coriander spices. I gotta give this a go! Beautiful work, Sue! OMG! This is one of those “put on anything” types of recipes!! Perfect. Oh do these look wonderful, I can see myself adding them to everything. 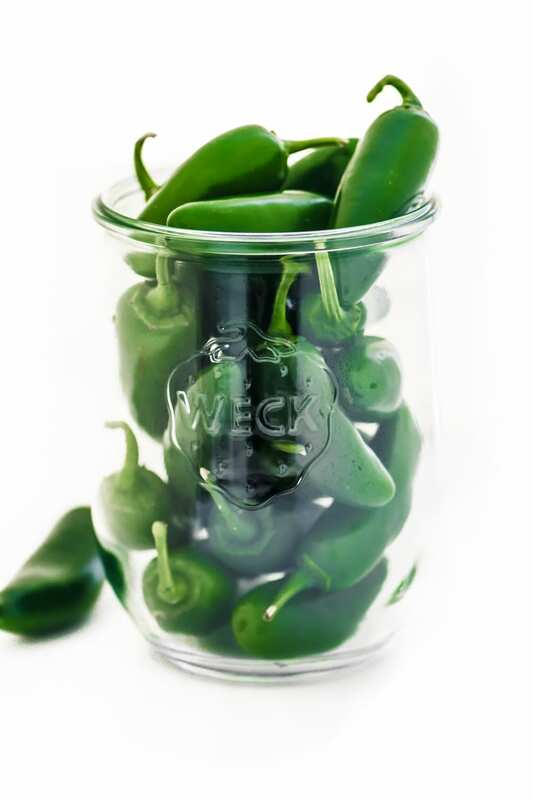 Love weck jars! I wish I had every Weck jar shape they make, maybe I’ll get there someday! Sue, this is wonderful! I want to run out and get a peck of peppers to quickle! I’m also a Weck girl, so I’m good to go. Wish you lived closer….We pick them by the bucket full. Oh my Victoria yes! That would be great!! Hubby likes Hungarian hot blocks so I have the medium heat and the hot ones so hope to pickle some like this for him! our plants were a bit slow this year but are coming along now so hope to still get a decent crop out of them!! Oh wow, really? In your own garden?? Forgot to answer about the cukes, yes, it would work perfectly with them. Learning the way of pickling… And I gave a TON of peppers in my tiny garden. Curious… Could you pickle these peppers with onions as well? I don’t see why not. I have a mixed pickle recipe coming up this week, I think you can mix and match what you like. I think there are so many ways to do this, it’s fun to experiment, good luck! I absolutely LOVE jalapenos, but I’ve found that over the years they don’t love me as much anymore! Such a shame as I so do love them! That’s a bummer ~ although I have noticed them getting less intense lately, every once in a while I’ll get a batch that hardly has any heat at all. The heat depends a lot on weather conditions as well as watering and soil conditions!! I have had some great peppers hot and sweet and then like last year we basically had a drought and very high temps so my peppers were awful and I had a lot of bug problems! This year we started out with no rain in June and 1st week of July so dry for 5 weeks but then they have now caught up and doing much better and getting some nice heat out of my Hungarian Hot Blocks!! hope you get a good crop this year!! I may hit the Amish up for some jalapenos as they grow them as well!! thanks!! I’ve really got to start pickling – I’ve heard so much about how good it is for your gut flora! And Jalapenos seem like the perfect place to start! These sound fantastic, love the addition of juniper in the pickling liquid! I had a bottle of berries in my spice rack, so I figured, why not! 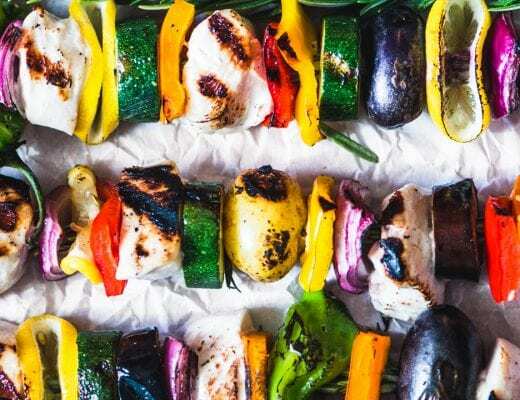 These pictures are just gorgeous – one more thing to pin and save for when I move back to a place where I can get jalapenos easily! These would be incredible on nachos, sandwiches, SO many things. I hear from a lot of my European friends that jalapeños are nonexistent there, too bad, I wonder if there’s a substitute? Gorgeous photos! These look like the perfect topping for tacos! Now this is really easy and fuss free. Love all the spices you put in there, Sue. So perfect for so many dishes! I need a big jar of these in my fridge :) Quick pickling is so awesome.